Baron is a sweet boy who loves attention and cuddles. He is new to our rescue and we are learning more about him in his foster home where he is getting along with the resident dog and the family children. I am interested in this sweet boy! Here is some information on the Texas Gulf Coast Bull Terrier Rescue program. * Step 1 : Complete and submit the Adoption Application form on our website – click on the TGCBT Rescue tab (if you need a Word format of this form emailed to you instead, just let us know). Please dont wait to complete the form, as you may miss out – we often have a very fast turn-around! 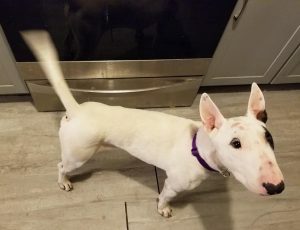 All our rescued bull terriers are temperament tested, spayed/neutered, brought up to date with shots & wormer, heartworm tested/treated and microchipped. Your new dog will come with a collar and leash and a food & treats starter pack. Adoption fees typically range around $325 and up, to help cover these veterinary expenses.